Prime Minister Narendra Modi Wednesday made a scathing attack on West Bengal Chief Minister Mamata Banerjee describing her as a "speedbreaker" in the path of development of the state and insisted she has to go to ensure speedy development of Bengal like rest of the country. Modi also took on the Congress over its manifesto that talks about reviewing some clauses of the Armed Forces Special Powers Act (AFSPA), saying it acts like a "shield" for the security forces in the fight against terrorists and make the soldiers vulnerable. He also took potshots at Trinamool Congress president as well other opposition leaders for expressing doubts over Balakot airstrike to avenge Pulwama terror attack and mockingly said "more than pain felt in Rawalpindi, it was felt by Didi in Kolkata". Modi's sharp attack on TMC chief came as he kickstarted BJP's election campaign in the West Bengal which sends 42 members to Lok Sabha, third largest after Uttar Pradesh's 80 and Maharashtra 48. "I have not been able to ensure the development of Bengal in the same speed as in the rest of the country. "The reason for this is that in Bengal there is a speedbreaker, and this speedbreaker is known as Didi," Modi said attacking chief minister Mamata Banerjee, who is fondly called "Didi" (elder sister). The PM stressed that she must be voted out of power to remove any impediment in the path of the prosperity of the people of Bengal. Pleased at the turnout at his maiden rally in the state after the announcement of Lok Sabha polls, he said: "if I had not come here to see the huge crowd, I would not have realised that didi's boat is drowning." Alleging that the Congress manifesto talks of reviewing AFSPA that "provides a shield to the security forces in the fight against terrorists", Modi said that the grand old party of the country "conspired" to make the soldiers vulnerable by taking this away from them. 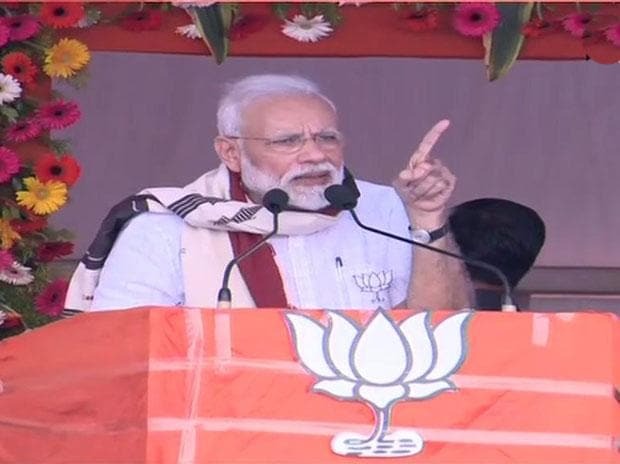 In his no holds barred attack on TMC president, Modi said that Banerjee has deprived the people of Bengal of getting medical benefits of upto Rs five lakhs under the 'Ayushman Bharat' scheme, by withdrawing the state's consent to it. He said that the farmers of the state have also not been able to reap the benefits of direct transfer of money to their accounts under the 'PM Kisan Samman Yojana' owing to the "speedbreaker Didi." Claiming that the TMC supremo is not worried about the welfare of the poor, Modi said that she thrives on the poverty of the people and her politics will end if people prosper. "She has put brakes in the path of the development of the poor," he said. Modi said that chit funds have looted the poor of Bengal and were assisted by ministers in Banerjee's cabinet, her MLAs and associates. "Didi has destroyed through her associates the poor people who invested in the chit funds," he said. Claiming that Didi, Congress and the Left are on the same boat, Modi said that their designs would not succeed since their fight is with a chowkidar. The PM said that despite several attempts by the opposition parties at scuttling his development initiatives, his government has been able to provide gas, electricity, toilets and other benefits to the people of the country. He sought to assure tea garden workers in the Darjeeling hills and the Terai region in the foothills of Eastern Himalayas of their welfare and that closed gardens would be reopened. Reiterating his accusation against Banerjee and other opposition leaders, who had posed questions on the outcome of the Balakot airstrike, Modi said: "Who was supposed to cry and who started crying?" "Chot usko laga aur dard inko lagi (The hurt was there and the pain was felt here)," he said. Modi said that more than pain felt in Rawalpindi, it was felt by didi in Kolkata. Regarding NRC, he said that rumours are being spread by those in TMC payroll that Gorkhas will be affected by the exercise and assured that the Gorkhas will not be affected by it. He said that the Left had not allowed the development of the state during its 34 year rule and Banerjee had done the same.